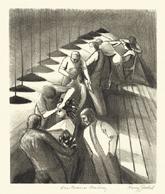 Beautician's Academy = c.1937, Lithograph. Edition c. 25. Signed and titled in pencil. Image size 12 x 10 inches (305 x 254 mm); sheet size 15 7/8 x 11 1/2 inches (403 x 292 mm). A fine impression, on cream wove paper, with full margins (3/4 to 2 1/2 inches), in excellent condition. Created for the Federal Art Project, WPA, New York City. Scarce. 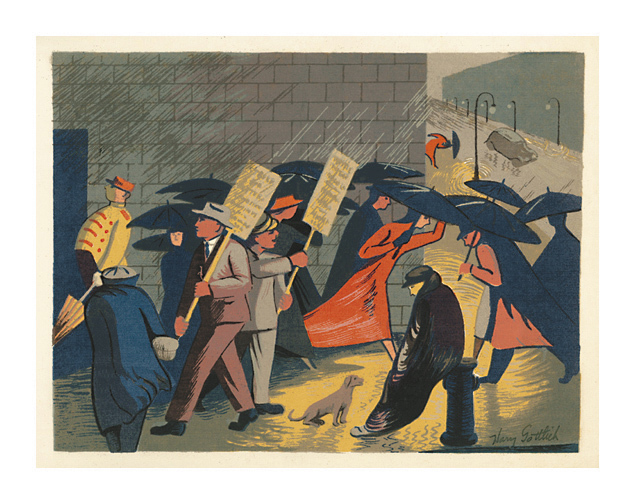 Nor Rain Nor Snow = c.1937, Color Serigraph. Edition not stated. Signed in the screen, lower right. Image size 10 7/16 x 13 7/8 inches (265 x 352 mm); sheet size 12 1/2 x 17 inches (318 x 432 mm). A fine, fresh impression, on heavy cream wove paper, with full margins (7/8 to 2 1/16 inches). A repaired tear in the top sheet edge, otherwise in good condition. Scarce. Reproduced: New Deal for Art, Marlene Park and Gerald E. Markowitz; the Gallery Association of New York State, 1977; and L’Amérique de la Dépression: Artistes Engagés des Années 30, Musée-Gallerie de la Seita, Paris, 1996. 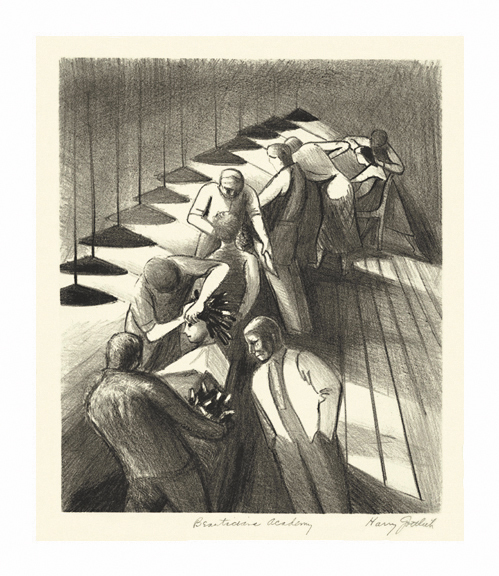 Exhibited: L’Amérique de la Dépression: Artistes Engagés des Années 30, Musée-Galerie de la Seita, Paris, 1996-97. 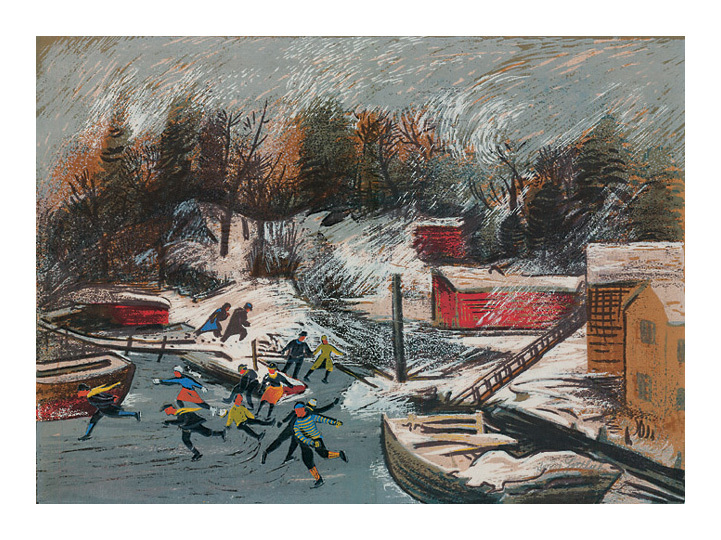 Skaters = c.1937, Color Serigraph. Edition not stated. Signed in pencil, in the image, lower right. Image size 14 1/2 x 19 3/4 inches (368 x 502 mm); sheet size 16 1/2 x 22 7/8 inches (419 x 581 mm). A rich, painterly impression, on tan cardstock, with full margins (5/8 to 1 3/4 inches); brown hinge tape residue on the top, left and right sheet edges, not affecting the image; otherwise in excellent condition. 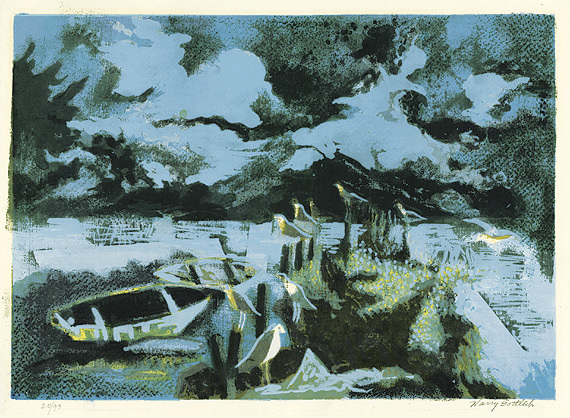 Long Island Memory = 1968, Color Serigraph. Edition 93. Signed, titled, dated and numbered 75/93in pencil. Image size 12 13/16 x 18 1/32 inches (328 x 458 mm); sheet size 18 5/8 x 23 inches (473 x 584 mm). A rich, painterly impression, with fresh colors, on heavy cream laid paper, with full margins (2 3/8 to 3 inches). Pale light stain within a previous mat opening; brown paper tape on the top and bottom sheet edges recto, otherwise in excellent condition.